Building Images is presented for the fifth time this year at Sto Werkstatt. 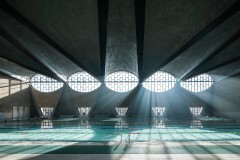 The exhibition has become a well-established architectural event, showcasing the importance of photography in the way we experience and connect with spaces across the globe. This year’s exhibition has been designed by London-based architectural practice, Mobile Studio Architects and features their innovative Modular Display Frames. The exhibition presents a truly global cross-section of the world’s best architectural photographers including overall winner Terrence Zhang, as well as short listed entrants Adam Letch, Brian Rose, Conchi Martínez, David Borland, David Crawford, Fabio Mantovani, Laurian Ghinitoiu, Martine Hamilton Knight, Ryan Koopmans, Siyuan Ma, Tom Roe, Tom Stahl, Wison Tungthunya, Yao Li and Zhenfei Wang. The 20 strong shortlist exhibited in Building Images, is selected by a highly acclaimed panel that included Amy Croft (Curator, Sto Werkstatt), Matt Emmett (Photographer and Award winner 2016), Katy Harris (Senior Partner and Head of Communications, Foster+Partners), Kate Goodwin (Head of Architecture & Drue Heinz, Curator at the Royal Academy of Arts), David Jenkins (Publisher, Circa Press), Mark Dytham (MBE & Astrid Klein, Klein Dytham Architecture) and Andrew Chen (AIA, NCARB, Cendes Design Studio). This shortlist was exhibited at the World Architecture Festival 2017 (WAF) in Berlin where visitors attending the festival cast their votes to decide on the overall winner. Building Images has quickly become the go-to annual reference point for discovering and physically experiencing the best in architectural photography. We are proud to continually create this platform in London to explore and celebrate the skills of architectural photographers, and to encourage debate around the discipline among photographers, architects and enthusiasts alike.